I really love flowers, but I love flowers from my own garden most of all. I get great joy from stepping out into my own yard and cutting fresh flowers to decorate my home. I love the bluish purple hydrangea we have in our front and back flower beds. They are called “Endless Summer”. They really live up to their name. They start blooming as early as May and keep blooming until Fall. 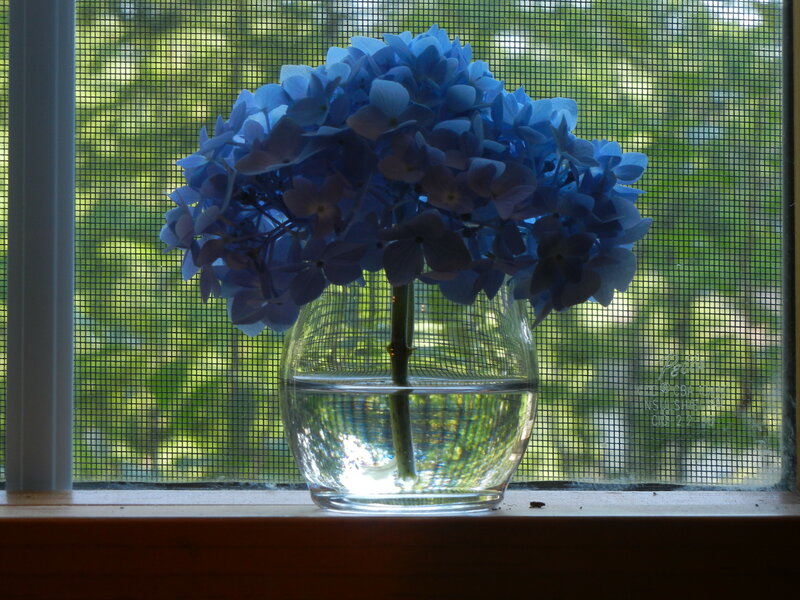 A great thing about hydrangeas is that they make awesome cut flowers. They will last at least a week in water. I have had some last even longer. Another cool thing that I’ve read about hydrangeas is that if you bury part of the stem (not a cut stem) it will take root and then when you cut it loose from the mother plant you have a whole new plant! Something I’m definitely going to try! I am also thinking of drying them out this year and having beautiful flowers all winter. 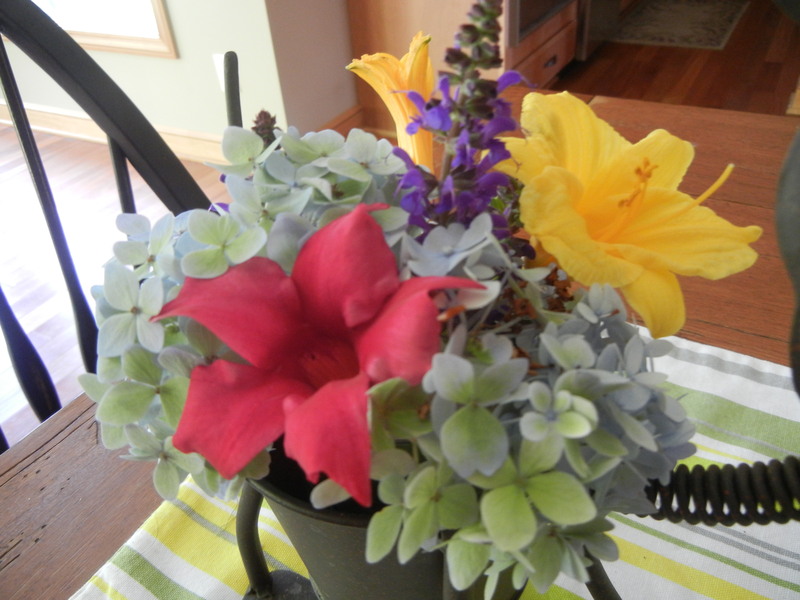 Along with the hydrangeas we also have bright yellow daylillies and purple salvia. These plants do not have nearly the blooms of the hydrangeas so I generally leave them alone, but yesterday I thought the daylillies had a few flowers to spare. I made this cute little arrangement to go in my favorite chihuahua planter. 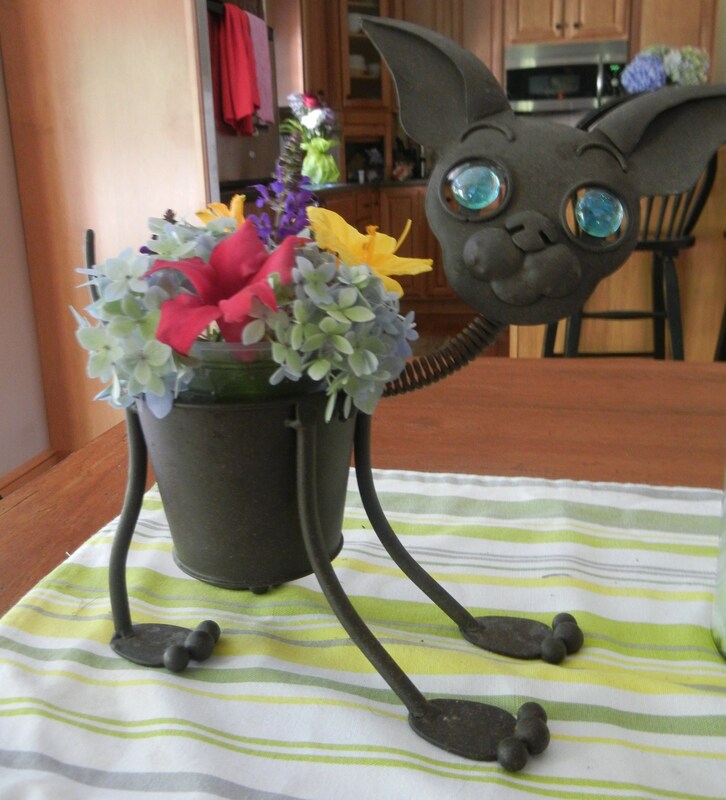 Ok, so it’s my only chihuahua planter, but isn’t it a cute one? I am not exactly sure what those pretty pink flowers are called. I bought a plant at Walmart for $5 on clearance, and oh my has it flourished! It’s popping out pretty flowers like crazy! It didn’t come with a tag, so I guess I have to do some investigating to find out what it is. It’s still in the pot, but it’s overflowing so I have to plant it soon. I think I might give it a permanent home down by the pond. This has been an extremely wonderful summer for plants. Just the right amount of sunshine and rain. What plants did you plant this summer? 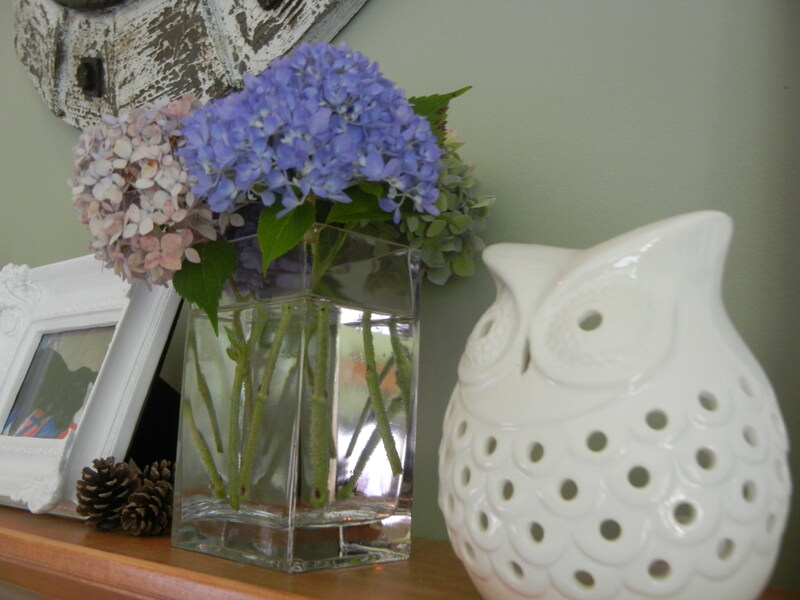 What are your favorite flowers to display in your home? 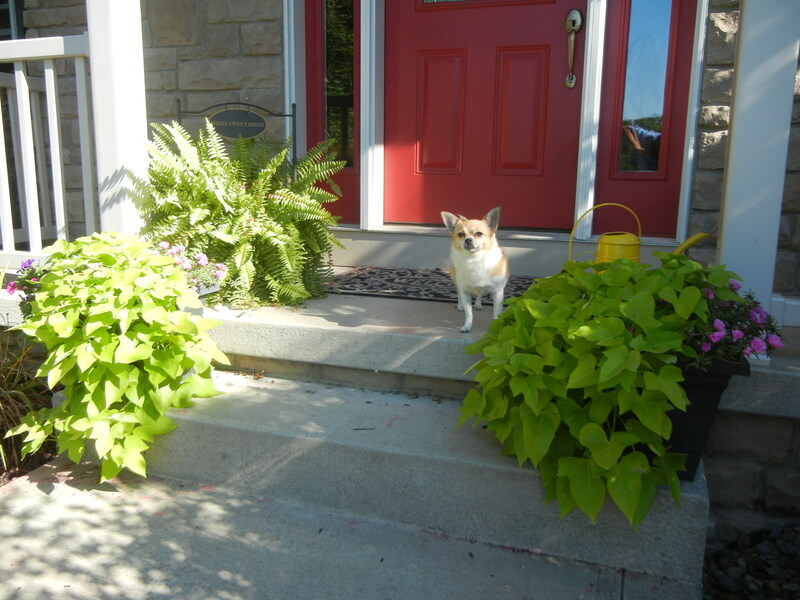 This entry was posted in decorating on a budget, outdoors and tagged chihuahua, earth, flower arrangements, flowers, gardening, home decor, hydrangea, love, outdoors, sunshine, things I love by Lauren. Bookmark the permalink. I have the girl version of that planter! Which is funny since you have a female dog and I have a male! hahaha! I didn’t know there was a girl version! Gorgeous flowers! I need to work on my green thumb a bit, haha! Thanks! 🙂 thanks for stopping by my blog!